It’s all very well for me to review the price of gold in USD’s however at the end of the day for a UK investor who will be living in the UK for the foreseeable future it is the price in GBP’s that is really important. So today let’s review gold when priced in GBP’s. At the time I am writing this post gold is sitting at £938. 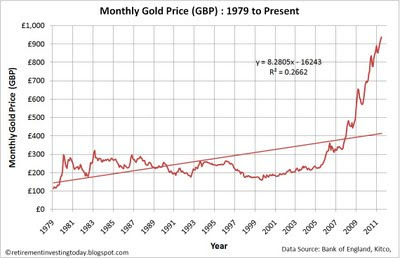 Looking at my first chart which tracks the historic Monthly Gold Price you might immediately start shouting bubble, bubble, bubble. However in my humble opinion it’s the second chart which corrects for the devaluation of our currency through inflation that is the important one. 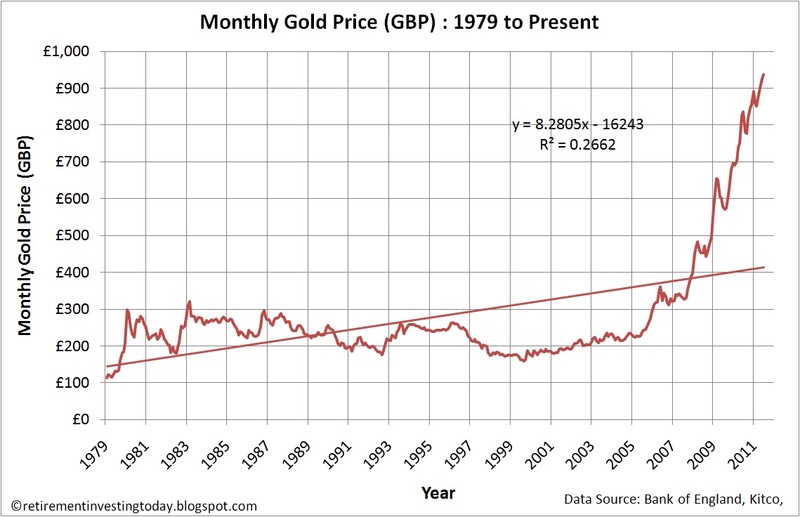 On this chart, which shows the Real (inflation adjusted) Monthly Gold Price we have still not yet reached a new high. That record is still held by January 1980 at £1,130.95 which is still 21% above today’s price. 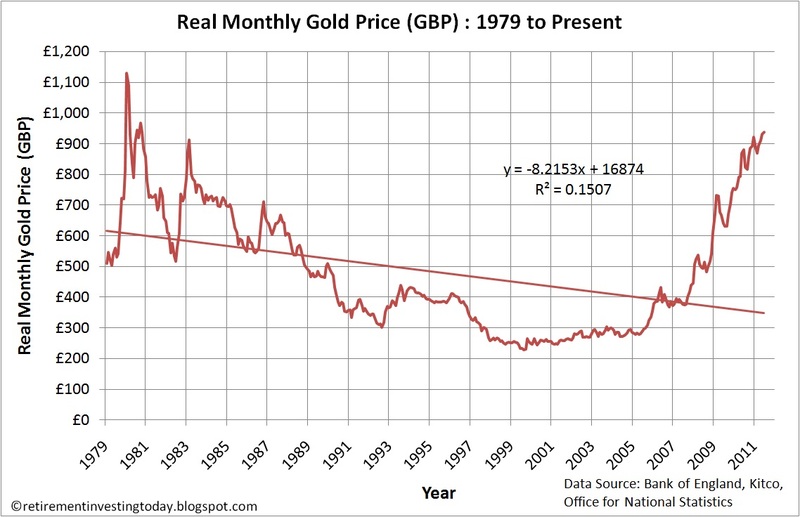 Of course real gold today is well above its long run average of £482.20. 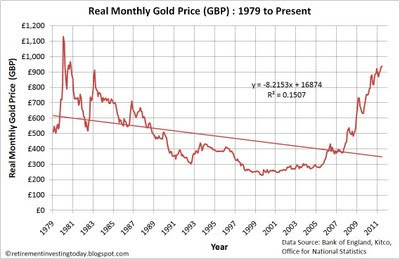 So by this measure gold currently looks over valued in GBP terms. 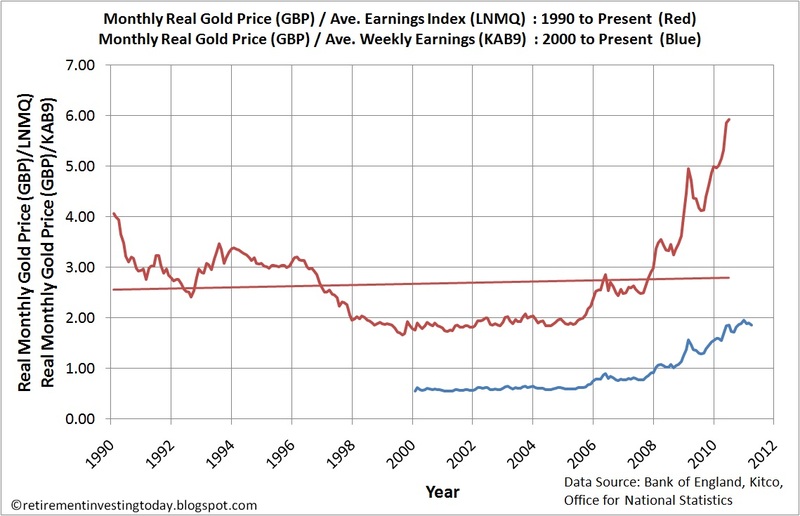 My third chart today shows the price of gold in GBP divided by the Average Weekly Earnings (KAB9) since 2000. To give a longer run perspective I also show the seasonally adjusted average earnings index for the whole UK economy (LNMQ) since 1990 which was banished by the Office for National Statistics (ONS) in 2010. 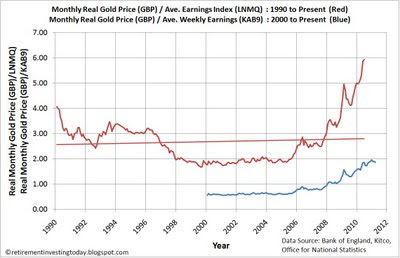 This ratio continues to show that if you were buying some gold with each pay cheque that gold was good value between 1998 and 2005 and is not such good value today. In earnings terms gold is as of March 2011 (the latest available data for KAB9) 3.4 times more expensive than the low of that period. When it comes to my own gold holding which currently makes up 5.1% of my portfolio I’m still doing nothing. I haven’t bought since May 2010 and my mechanical investment strategy hasn’t forced me to sell to rebalance either. - Last gold price actual taken during trading on 08 June 2011. - April, May and June 2011 inflation is extrapolated from the retail prices index (RPI).